San Francisco, CA, May 6, 2010 – VIZ Media, LLC (VIZ Media), one of the entertainment industry’s most innovative and comprehensive publishing, animation and licensing companies, has announced the release of I’LL GIVE IT MY ALL… TOMORROW. The series, created by Shunju Aono, will debut on May 18th under the VIZ Signature imprint, is rated ‘T+’ for Older Teens, and will carry an MSRP of $12.99 U.S. / $16.99 CAN. This is the story of a hapless forty year-old salaryman who quits his job to pursue his dream of becoming a manga artist – and the family that has to put up with him. While not terribly unhappy, Shizuo Oguro can’t fight the feeling that something in his life just isn’t right, so he walks away from his stable (yet boring) day job to embark on a journey of self-discovery. Unfortunately for his family, this journey also involves playing video games all day while his teenage daughter and elderly father support him. Will Shizuo succeed in creating a true manga masterpiece, or will he be just another dropout living a life of slack? In the opening volume, Shizuo Oguro is living his dream… sort of. Feeling like his life has been a complete waste Shizuo breaks free from the corporate rat race and charts a new and fairly random career course to become a published manga artist. Sure, he lacks the talent, discipline, or any of the other skills necessary to become a success in the manga industry, but that won’t stop Shizuo from achieving his dream! Creator Shunju Aono won Young Magazine’s 45th Chiba Tetsuya Award in 2001 and also won the 17th Ikkiman IKKI Newcomers Award in 2005 for his manga series KALEIDOSCOPE. His current series, I’LL GIVE IT MY ALL… TOMORROW, is currently featured in IKKI magazine. VIZ Media’s innovative partnership with Japan’s IKKI magazine brings a diverse collection of exceptional manga series to audiences in North America. From action to comedy to drama, slice-of-life stories to surrealist fantasies, the uniting themes these works share are an uncommon emphasis on creative quality and on pushing the boundaries of the manga norm. 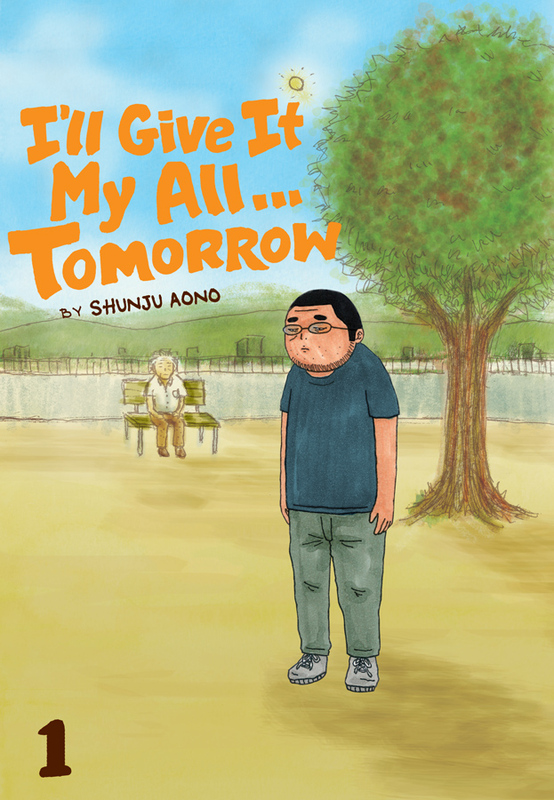 I’LL GIVE IT MY ALL… TOMORROW is currently featured online at SigIKKI.com, the groundbreaking web destination for a broad range of unique manga for mature audiences. For more information on other VIZ Signature titles and to check out a sneak peek of Chapter one through five of I’LL GIVE IT MY ALL… TOMORROW please visit www.SigIKKI.com. This entry was posted on Friday, May 7th, 2010 at 5:49 am and is filed under Digital delivery, Linkblogging, Press releases, Viz. You can follow any responses to this entry through the RSS 2.0 feed. Both comments and pings are currently closed.